It’s not every day that a ski resort massively expands out its skiable acres. Maybe it opens a new lift or on-mountain restaurant, but for a resort to increase its footprint by 20% is an enormous undertaking. Yet that’s exactly what Colorado’s Breckenridge Ski Resort is doing with its new mountain, called Peak 6, which opens on Christmas Day. And since I was out in Colorado, I stopped by Breck for a pre-opening look. First off, the stats: Peak 6 brings 400 acres of lift-served terrain and 143 acres of hike-to terrain (skewing intermediate but pretty evenly split between intermediate and expert trails), three new bowls, eight new cut trails, and two new chairlifts. In all, it’s one of the biggest ski-area terrain expansions in North America in the past decade. And it’s on top of Breck’s existing five peaks, 2, 900 acres, four terrain parks, a 22-foot superpipe, 11 bowls, and the highest chairlift in North America. But the new area adds some elements that will make Breck even more appealing—like glade skiing. These new trails aren’t tight-packed with trees, but have them spaced far enough apart to get a Sno-Cat through to groom. It’s the kind of tree skiing I like—enough wood to make me feel like I’m a tree skier (since I’m really not), but not so much that I’d be worried about injuring myself (which I would in thick trees). The new turf also adds bowl terrain above tree line, designed for intermediate skiers—also appealing to a twice-a-year downhiller like me. And people are psyched about this new area. I heard enthusiasm from a Sno-Cat driver (“I’ve already GPS’d some awesome secret spots”) and snowboarders sharing my chair lift on the main part of the mountain (“We can’t wait to shred the new runs”). 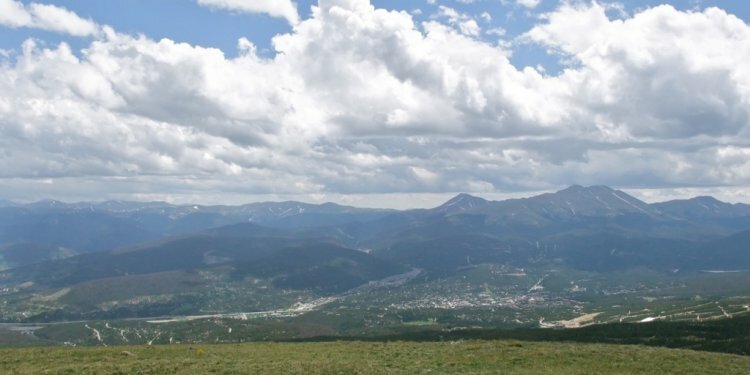 Maybe one of the reasons for the excitement was that Breck got a lot of people involved in this project, crowdsourcing trail names from more than 1, 800 people from around the U.S. and beyond. I wanted to hit some of those trails myself, but since the lifts weren’t quite ready last week, I and a few other journalists hopped in a Sno-Cat to do some shredding of our own. It didn’t hurt that the trails had been groomed, with six inches of fresh powder on top. It also didn’t hurt that since the area wasn’t yet opened to the public, we had the place to ourselves. We started at the top of the lift, above tree line, and followed our ski patrol leader, cutting fresh tracks and forming figure 8’s in the middle of a nice wide bowl. As snow fell, we hit the tree line and schussed through the widely spaced pines, ankle-deep in powder, practically gliding on top of the snow. Pretty much perfect. All this was down trails that only a handful of people had skied—ever. It was an exciting preview of a great new area. And it’s an exciting development for an already-terrific resort. I can’t wait to come back and ski it all—even with the snowboarders, cat drivers, and others who are just as anxious to get out there and start shredding.